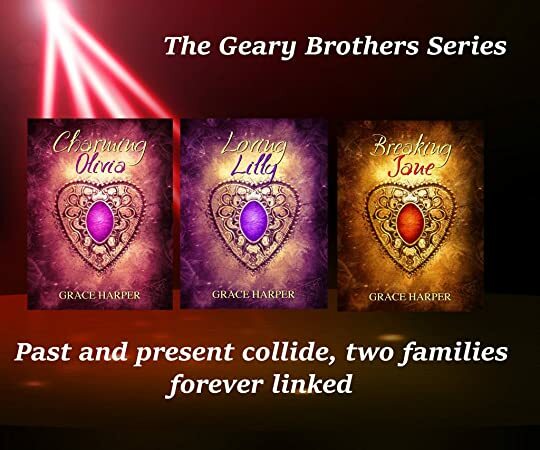 I am going to start out by saying that I really enjoyed the first book Charming Olivia (Geary Brothers, #1) by Grace Harper and I was thrilled that Olivia and Jack make several appearances in this book including their wedding, so if you haven't read the first book you really should before you read this one. Elijah is the owner of the pub that Lilly has been frequenting everyday for the last six months. There is chemistry between the two but for some reason Elijah has been hesitant on asking Lilly out. Elijah has even decided to go out with someone else so that he doesn't get involved with Lilly, this was a strange concept but hey it worked, for a while anyway. The chemistry between Lilly and Elijah was sweet yet steamy, they really do have a great time between the sheets when they finally get there, and it wasn't for a lack of trying either...they kept getting interrupted. There are a lot of secrets between the elders in both families and I look forward to reading Breaking Jane (Geary Brothers, #3) by Grace Harper to figure out what the heck has been going on, especially with Lilly's parents...there is something wrong with the way they treat their daughter and favor the son (the druggie) and I am dying to know why that is.